Jewellery designer / maker, Georgie Collins, got in touch with me needing an online store for her business Rock That Biscuit. Georgie designs and makes bracelets, earrings and necklaces from her home studio in Bristol. She also accepts requests for bespoke commissions, using superior quality leather, sterling silver and semi-precious stones. Georgie had never had a website for the business before, working purely from word-of-mouth, but now felt the need to take the next step. Georgie and I met in person to discuss the project. It became clear that she wouldn't have the budget for my usual recommended route of using my skills to design the site, then using a freelance Wordpress specialist for the build. Having recently re-built and launched my own website using Squarespace, I recommended this as a route to go down. I explained some of the small limitations of the set templates, but assured her that we could create a clean, clear, beautiful looking site. After all, the colourful jewellery products should be the hero! 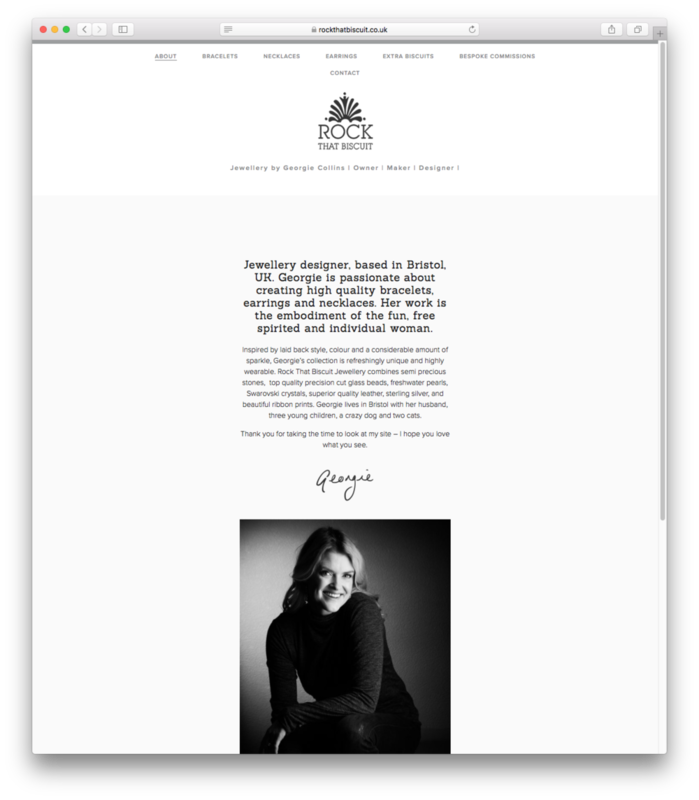 Simple, up-front categorisation on the home page, easily leads visitors to bracelets, earrings, necklaces or ‘Extra Biscuits’, Georgie’s bespoke extra pieces. The relevant shop page, with colourful photography is easy to navigate, including rollovers with product information. 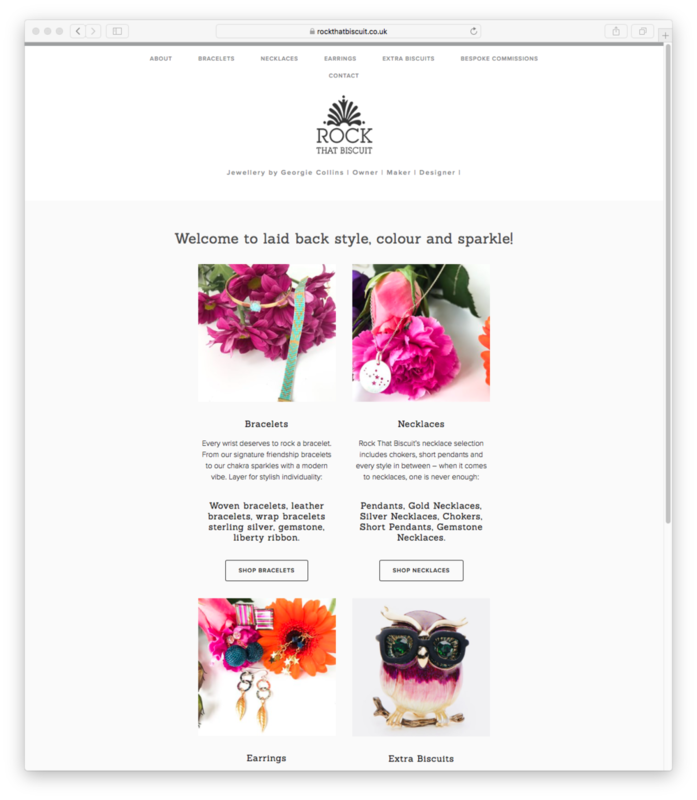 The intuitive Squarespace backend allows Georgie to update products and keep track of stock, using one central inventory system. Georgie simply needs to check the appropriate tag to make sure they then appear on the correct product page. Payment systems were set up by linking PayPal, as well as Stripe, so debit and credit cards could be accepted. A ‘Get in Touch’ page allowed customers to get in touch about bespoke commissions and used colourful photography to help explain the creative influences behind Rock That Biscuit’s jewellery designs. The final site was built in the Squarespace platform, all hidden behind a holding page, with integral contact form, until the site was ready to launch. Take a look at the now live site here.